I’ve written about George before – but she’s so eminently “quotable” that I can’t resist a few more nuggets of wisdom from her on her birthday (born this date in 1949). 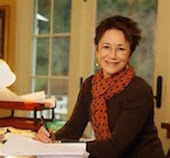 A native of Ohio who earned her writing degrees in California, she has risen to prominence for her mysteries set in Great Britain and featuring Inspector Thomas Lynley. The Inspector Lynley Series has been much celebrated on both the BBC and PBS. George said it is the job of the novelist to touch the reader. “Whether it is literature or not is something that will be decided by the ages, not by me and not by a pack of critics around the globe. “I try to create a challenge for myself in each book.